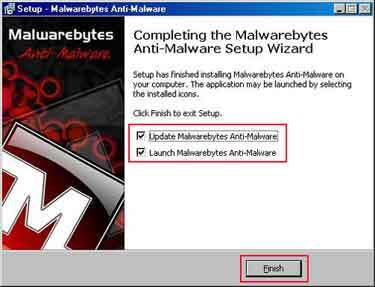 The Malwarebytes Download tutorial shows you how to download and install the Malware Bytes Anti-Malware program, first time, without any complications. Malwarebytes is a very popular application, and according to the developers, 97% of all online threats are Malware. This is a scary figure! Your home computer must be protected from such threats. Running Internet connected machines without adequate security protection is a recipe for disaster. Your computer is likely to be rendered inoperable within minutes. In addition to security measures such as Computer Virus Removal programs, a robust anti-malware program is an essential security tool. This is the first of a 2-part tutorial. Part 2 walks you through the steps to make the best use of 'MBAM', especially if you decide to buy the professional version. I also offer my own humble opinion throughout the discussion so you can make an informed choice as to whether you want to invest in Malwarebytes. It is worth making the point now that the Malwarebytes Anti Malware download is NOT a replacement for an Anti Virus program!. To illustrate the point, the image below is from a Windows XP Service Pack 3 computer that does not have an anti-virus program installed, but has Malwarebytes installed. The Operating System shows a Security Risk message in the System Tray. Although some anti virus programs scan for specific malware such as trojans and rootkits, they may not be as effective at removing them as a dedicated anti-malware solution. Do you have a dedicated Anti-Malware program installed on your computer? Which program do you have, and why did you decide on that particular one? Explain to your fellow readers what your opinions are on this subject. We are interested in your thoughts! Simply complete the Malwarebytes or not Malwarebytes Form at the bottom of this page. Read Site Visitors Thoughts on all things Malwarebytes and anti-malware related. 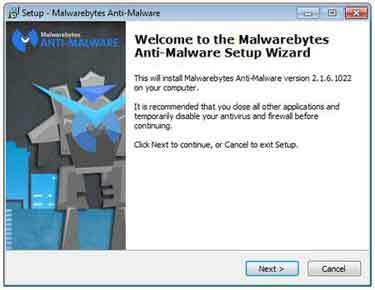 The following Malwarebytes Download and Installation steps are demonstrated in a virtualised Windows 7 machine. The trial version of Malware Bytes is used. If you already have a Windows malware program installed I strongly advise you uninstall it before trying out Malwarebytes. I would not want you to start having unnecessary problems with your computer as a result of following these steps! If you are in any doubt, please do not proceed! Open your web browser and go to the Malwarebytes Website (Opens New Window). Click the Free Version Download and the application will automatically download to your computer. The Malwarebytes download is about 22Mb in size and has a small footprint i.e. does not take up too much computing resource - CPU, RAM etc. on modern computers. Double left click the downloaded mbam-setup-x.x.x.xxxx.EXE file then left click the run button to initiate the installation process. Click Yes if prompted by the Windows 7+ User Account Control. Select your language when prompted (Default language is English) then select the OK button. On the Welcome screen select the Next button. The next window shows you some of the programming issues that are fixed in the version of Malwarebytes you are installing. Next you can decide where to install the Malware download files. Unless you have organised your computer to install programs into a dedicated directory, accept the suggested folder and click Next. Accept the suggested Start Menu Folder. You can change the name of this if you want by simply overwriting the suggested name. You also have an option not to create a Start Menu folder. If this is what you want to do, simply click the box on the window then click the Next button. On the Select Additional Tasks window, decide whether you want to Create A Desktop Icon. Uncheck the box if you do not want to do this. Click Next. If you are Ready To Install MBAM click the Next button. If you are unsure about your previous choice, click the Back button and review your decisions. MBAM will now install onto your computer. Once the installation process completes, decide what you want to happen after you click the Finish button. Depending on the version downloaded the options at the end of the installation process can vary. After launching MBAM the software automatically detects and downloads the latest version of the malware database. This is for maximum protection and should be done on a schedule or at least a daily basis. To start the free trial simply click the link on the dashboard. I recommend clicking the Scan Now button to initiate a first scan of your machine. The following Youtube video demonstrates the Malware Bytes download and installation steps. It is about 9 minutes long, but worth your viewing time! It also goes into detail about how to use Malwarebytes which is the subject of Part 2 of this how to series. Malwarebytes is potentially the best Malware removal software on the market today. Do you agree? Complete the form below and let me know your views. CNET (Opens New Window) provide a good review of the Malwarebytes free download and includes reviews by fellow program users. Do you agree with their views? Do you have an Anti-Malware program installed on your computer? Which Anti-Malware program do you have? Why did you decide on that particular one? Enter Your Title e.g. "Malwarebytes Has Never Failed Me!"